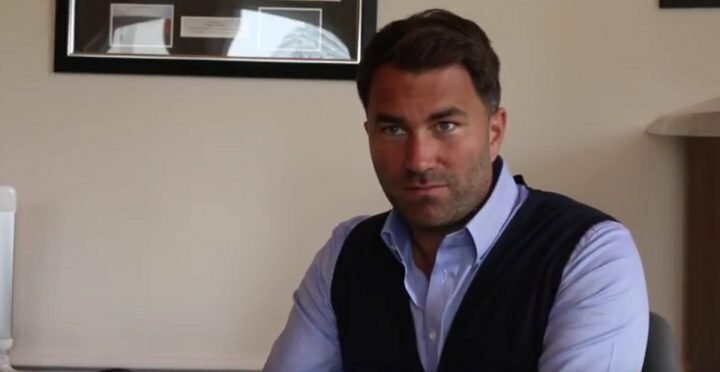 By Scott Gilfoid: Eddie Hearn says he’s improved the offer for the Anthony Joshua vs. Deontay Wilder fight, but he says his offer must be accepted or they will “move on” and face Alexander Povetkin next. Hearn isn’t saying what so-called improvements that he’s made to the $50 million offer that Wilder’s team made to Joshua. It’s interesting that Wilder has no choice but to fight Joshua in the UK, and yet Hearn is willing to let AJ fight Jarrell ‘Big Baby’ Miller in New York. What does that tell you? There’s a lot of fear involved with Hearn and Joshua, as I’m concerned. I don’t think Joshua’s team wants the fight with Wilder. The sticking point has been Joshua’s reluctance to fight Wilder in the U.S. It’s Wilder’s team that is giving Joshua the $50 million guaranteed cash for the fight, and yet he’s still insisting that the fight take place in the UK. It’s mind-boggling. You don’t dictate terms when the money is coming from your opponent. I’m not sure that Joshua is aware of that. Wilder said that since Joshua only wants to fight in the UK, then he’s going to have to take a HUGE payday cut of $20 million from the $50 million offer that his team made to him. Of course, Wilder doesn’t speak for his management, who might not want to give Joshua anything if he’s going to insist on the fight take place in the UK. I mean, why give Joshua any offer if he still insists that his team are running the show in the UK? ”They have our offer, so they have to accept it or move on. It’s not a case of if you don’t accept this offer the fight is dead, we will just fight Povetkin and carry on our negotiations to the next one,” Hearn said to skysports.com. This is what I was afraid of. Hearn’s A-side mentality has finally gone to his head completely. He’s now talking like he’s in charge of the show when he’s the one with the money. There’s only one reason for this. Hearn has become spoiled completely. For Hearn to be speaking in this way in sending a message to Wilder and his team, it can mean only one thing. They don’t want the fight with Deontay. It sounds like Joshua and Hearn have made their mind up that they’re going to be fighting Povetkin next. Oh well, I think it was academic the fight wasn’t going to happen as soon as Joshua stubbornly insisted the fight could only take place in the UK. Once Joshua said that, it was clear that he doesn’t fancy the fight. Basically, Joshua was saying that he’s willing to walk away from the Wilder fight just so that he doesn’t have to fight him in the U.S., which is kind of sad. If you look at Joshua’s last fight against Joseph Parker, it looked to many boxing fans that the New Zealand fighter had no chance of winning due to the referee preventing inside fighting. The bout took place in Cardiff, Wales in the UK. When fans see that kind of a fight, it looks to some like Joshua needs the home advantage for him to win against top level fighters. In Joshua’s fight before that against Carlos Takam, the referee Phil Edwards stopped the fight suddenly after AJ slightly buzzed the challenger in the 10th. Takam wasn’t badly hurt, and yet the referee stopped the fight suddenly without warning. The match took place in Cardiff, Wales. “We are close to closing a deal with Povetkin with Robinsky and World of Boxing and once the deal is closed, there is no Deontay Wilder,” Hearn said. By Hearn and Joshua refusing to give ground by agreeing to fight Wilder in the U.S, they know that Deontay and his team will never agree to such an insane notion of having to fight in the UK after they’re the ones giving AJ the $50 million guaranteed purse. When the other side is the one coming up with the money, you’re expected to fight wherever they want you to. That’s how it works in boxing. If Wilder wants the fight to take place on planet Neptune, you’ve got to agree if they’re the ones coming up with the money. But for Hearn and Joshua to be saying that they only want the fight in the UK, it’s code for, ‘We don’ want the fight with Wilder.’ That doesn’t mean that Joshua and Hearn won’t want to fight Wilder in the future, but right now, it’s clear they don’t want to take that. Hearn might as well call off the negotiations with Wilder if he’s going to be giving him a take-it-or-leave-it offer. If you look at it from Hearn’s perspective, if he makes the Joshua-Wilder fight, AJ has a good chance of losing by knockout. If Joshua loses to Wilder, then all that sweet cash he’d get from the Tyson Fury fight will fly out the window.